The notorious anti-LGBTQ hate group were met with widespread derision during their protest at VCU on Monday. 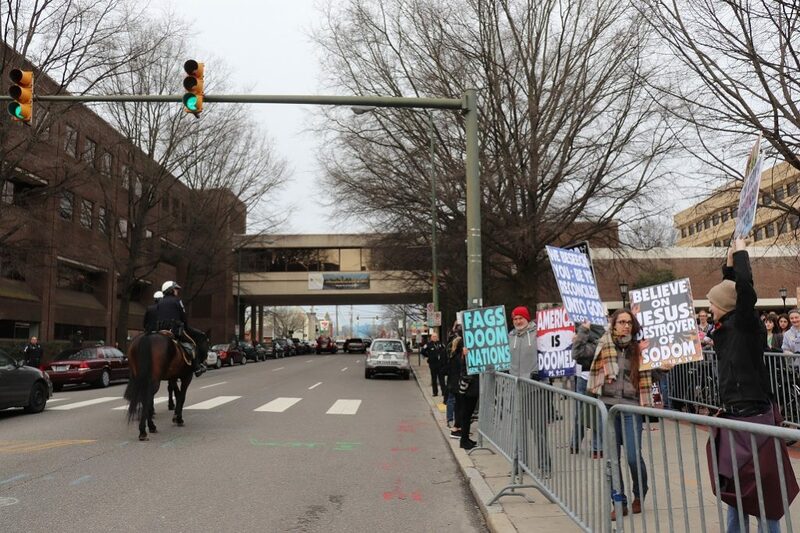 At VCU Monday, students, metalheads, and the general public came out in support of the LGBTQ community to counter-protest the Westboro Baptist Church’s visit to campus. Westboro Baptist Church (WBC) were in town to protest against the existence and political power of Delegate Danica Roem, the first transgender person elected to state-level political office in the United States. 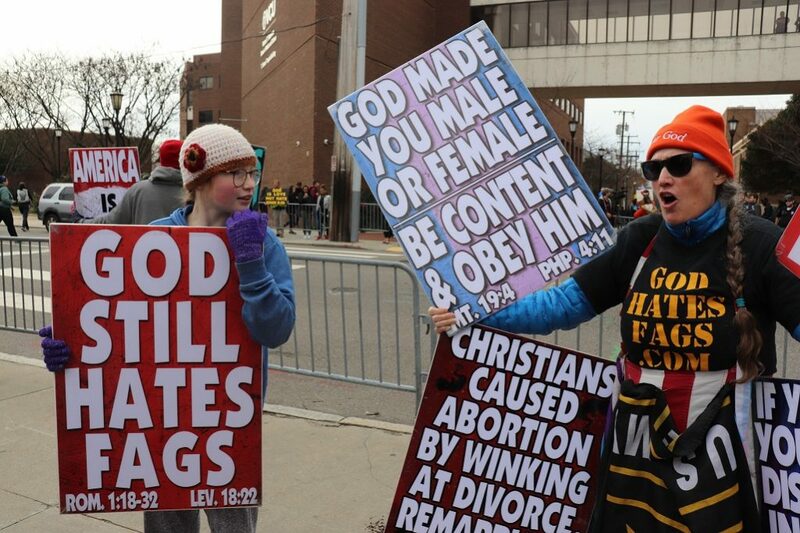 Even before the protest took place, it had already resulted in unintended consequences for WBC. Their attacks against Danica Roem, who represents the 13th District in Virginia’s House Of Delegates, helped strengthen Roem’s campaign for re-election in November. Roem reported in a tweet Monday night that she was able to raise over $36,000 for her re-election campaign through her #WestboroBackfire online protest. Police presence was large, and included two police officers on horseback. Over one hundred counter-protesters were present as well; some dressed in wigs, others dressed in pride flags, and one person even played a guitar. Members of local metal band Lamb Of God brought kazoos and other plastic instruments, intent on drowning out the WBC members who’d shown up. 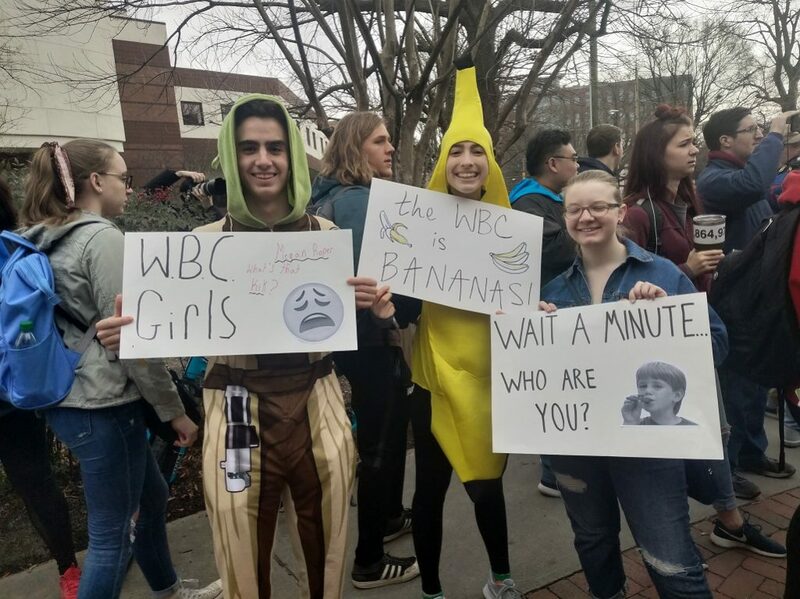 Some counter-protesters voiced their problems with VCU’s reaction to advance notification of the WBC visit. Lily Hamilton of VCU’s Queer Action created a solidarity space away from the initial counterprotest, in which she critiqued both Westboro Baptist Church and VCU’s lack of transparency with the student body. She cited incidences in which VCU said WBC would have a spot reserved for them on campus, then later withdrew the statement. VCU policy does allow for political groups, regardless of message, to reserve a space on campus to promote their agenda. The group may reserve space as little as five days in advance. No violence occurred at the protest, though some protesters made loud use of profane language. However, the police presence was clearly intended to protect the WBC, who were highly outnumbered. Plenty of media were on the scene to cover the story. However, most focused on the WBC themselves, giving them a great deal more interview coverage than the counter-protesters. Nonetheless, there was a strong sense of community among the counter-protesters. Written by Sage Canady and Marilyn Drew Necci. Photos by Alexandra Zernik, Capital News Service, unless otherwise noted. Democrats in Virginia are eschewing corporate cash in favor of grassroots fundraising, focusing on the people behind the money. A report by the Virginia Public Access Project shows freshman democrats are taking the charge on giving power to the people. Legislators in 2018 have diversified their campaign funding, especially when it comes to corporate donors. From 2008 through 2016, 39 percent of funding came from corporate donors; in 2018, that number dropped to 8 percent. They also raised more money, increasing the average from $14,000 to almost $36,000. Del. Lee Carter, a Democrat who represents Manassas, said corporate money is becoming a liability to delegates. He has tried to separate himself from the influence of monopolies by refusing to take any money from corporations. “I think it’s important I walk the walk,” Carter said. He said he is trying to demonstrate he is serious about separating himself from corporate interest. Carter is part of the People’s Caucus, a coalition of legislators that refuse campaign contributions from public service corporations. Three of the four members in the caucus, most of whom are freshman democrats, were patrons of House Bill 562, a bill introduced in January that would have prohibited candidates from accepting contributions from public service corporations. Freshman delegates Carter and Kelly Fowler, who represents Virginia Beach and Chesapeake, and Del. Sam Rasoul, of Roanoke, joined Del. Danica Roem, of Manassas Park, in supporting the bill. Carter believes the purpose of for-profit corporations is for profit. The closer a candidate is to a corporation, the more likely it is the corporation may expect something in return. He hopes the overall culture of corporate donations changes. Roem, who introduced HB 562, said contributions from for-profit corporations are not just about supporting a candidate. She said she wants to make clear to her constituents they are her bosses, she answers to them and not to corporate donors. When corporate donors appear on campaign finance reports you don’t know the human being that decided to donate that money, Roem said, describing it as a transparency issue. She said corporations are using “hostage money” to have a seat at the table to steal influence. She doesn’t think the regulated should have undue influence over the regulators. She also makes a distinction between donations from individuals, social justice organizations and corporate donors because those donations are in support of her platform. LGBTQ and Human Rights organizations have supported her, Roem said, because of the historic importance of her being the first openly transgender lawmaker. To her, this distinction between social justice groups is important, because they are advocating for civil rights and equality, not for personal profits. Roem, Carter and Fowler are in good company with their fellow freshman democrats. Of the 16 delegates included in the report, 13 accept 10 percent or less from corporate donors. Del. Jay Jones, of Norfolk, is one outlier; he’s received the most in corporate contributions at 73 percent. Multiple attempts to reach Jones went unanswered. Roem said money doesn’t win elections, though. In fact, all of the delegates in the People’s Caucus were outspent by their opponents. HB 562 was passed by indefinitely in a subcommittee of the committee on privileges and elections by a republican majority. Passed by indefinitely means the bill could be considered at the next meeting, but that it would not move further in the legislative process without further action. The senate version of this bill, Senate Bill 10, introduced in November by Sen. Chapman Peterson, of Fairfax, had a similar fate. Roem believes a democratic majority is necessary in both the House of Delegates and the Virginia Senate for true campaign finance reform.